Dust pollution is one of the greatest problems in drywall sanding. That is why MENZER came up with AV technology. An integrated dust bag system removes dust immediately and effectively at the source – without any need for an additional industrial vacuum cleaner. 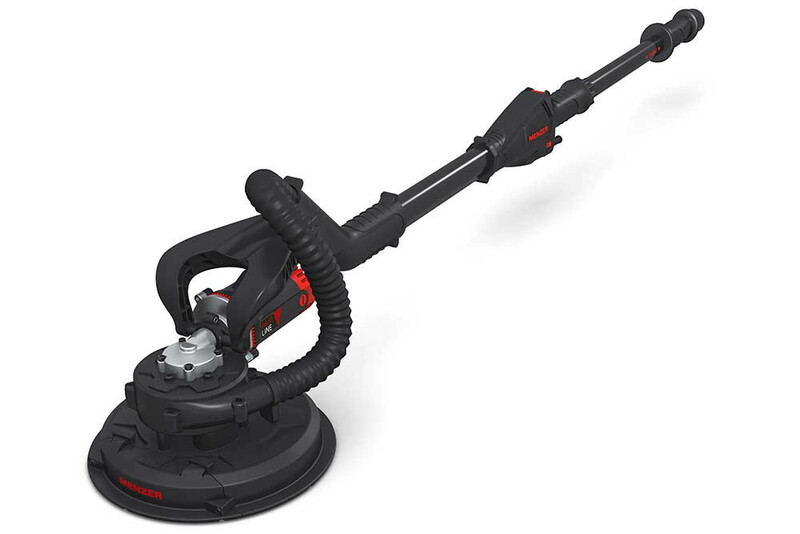 The MENZER LHS 225 VARIO AV drywall sander comes complete with an M-certified dust bag. Our MENZER LHS 225 VARIO AV features a steplessly adjustable work length between 1,550 and 1,950 mm. In combination with the adjustable handle and the extremely agile cup wheel, high walls and multi-angle areas will never be a problem again. The extremely powerful and long-life 710 W motor of the MENZER LHS 225 VARIO AV is positioned exactly where it is needed – at the cup wheel. The direct drive system has two distinct advantages: On the one hand, all motor power is transferred directly onto the driving disc without any loss. The abrasion rate is therefore higher and sanding more efficient. And on the other hand, there is no need for a high-maintenance drive shaft. In effect, maintenance costs are significantly reduced, while the MENZER LHS 225 VARIO AV enjoys a much longer service life. Our MENZER LHS 225 AV gives you complete freedom of movement for your sanding job. The extremely agile cup wheel adapts to the wall or ceiling in any position. Even hard to reach areas are sanded comfortably and efficiently with this cup wheel. Our MENZER LHS 225 VARIO AV can easily work edges and difficult transition areas because of its removable nose section. You will achieve even faster work progress when sanding walls and ceilings.